Artists from Echo Beach Gallery, Ilfracombe, North Devon, were invited to donate paintings to the Wall of Inspiration at The Prince's Trust Inspiring Art Silent Auction on 22nd October 2014, at Castle Fine Art Gallery, Mayfair, 24 Bruton Street, London. It was a huge privilege to have the opportunity to be involved with the Trust on this occasion and to be one of a group of artists from North Devon allowed to have their work displayed alongside some well-known, talented individuals. 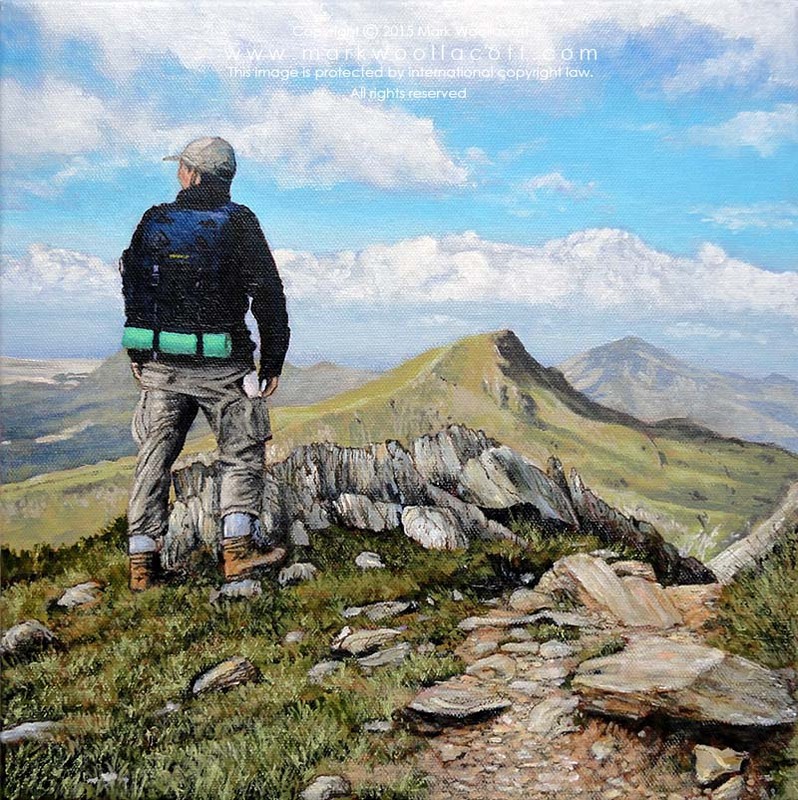 When I heard about the silent auction from Nina Lording (owner of Echo Beach Gallery) and read about the auction's theme “inspiration”, I knew straight away that the image of the mountains was the one I would paint for the Trust. The brief was that the invited artist could choose their own media (a painting, drawing, sketch, collage etc.) to create an artwork on the subject of “inspiration”. The Trust supplied each invited artist with a single 12" by 12" canvas. Once painted, the artist returned the painting in the provided stamped addressed box to the Prince's Trust, London, where it would then be framed by the Trust. The deadline for sending the painting was extended to 26th September 2014. Each painting would be sold anonymously at a silent auction, along with approximately twenty other pieces of art donated by leading U.K. artists, displayed together on a Wall of Inspiration to raise money for the Trust. My painting didn't sell during this auction, but was sold during the next silent auction held at The Prince’s Trust and EMC Leadership Dinner, at The London Hilton, Park Lane, London, on Thursday 29th January, where it sold for £750. At this event The Prince's Trust raised a staggering £419,000. This amount will make a tremendous difference to the young people the Trust supports who sometimes suffer with mental health problems, are in or leaving care, or experiencing homelessness etc. The canvas was painted with a Old Holland Cadmium Red Light coloured ground, to give the painting “warmth”. For the underpainting I used mostly Green Umber and Olive Green (for the grass and mountains), and mixed it with Old Holland Yellow Light where it needed to be lighter. I mixed Violet-grey to this mixture in order to paint the distant mountains. The Violet-grey helped to set the mountains back in the picture. For the sky, I used a mix of Cobalt Blue, Cerulean Blue and a small amount of Brilliant Blue mixed with white. The clouds were painted using a mix of Violet-grey and Titanium Buff Deep (for the first layer) and white for the second layer. The jacket was painted with Payne's Grey. For the stones and rock I used Violet-grey, then painted a little Raw Umber in places. I mixed Olive Green with white and painted the lighter areas of grass. I worked next on the trousers and backpack. I added a glaze over the clouds, close to the horizon, and over the distant mountains in order to set them back in the picture. I worked on the details: the creases in the trousers, the small stones on the ground, and blades of grass. I added a glaze to the stones, to enrich them and to provide a warmth and softness to the lower right corner of the painting. The painting was signed and dated on the back (on the wooden stretcher bars) of the canvas. The title of the painting was also written. 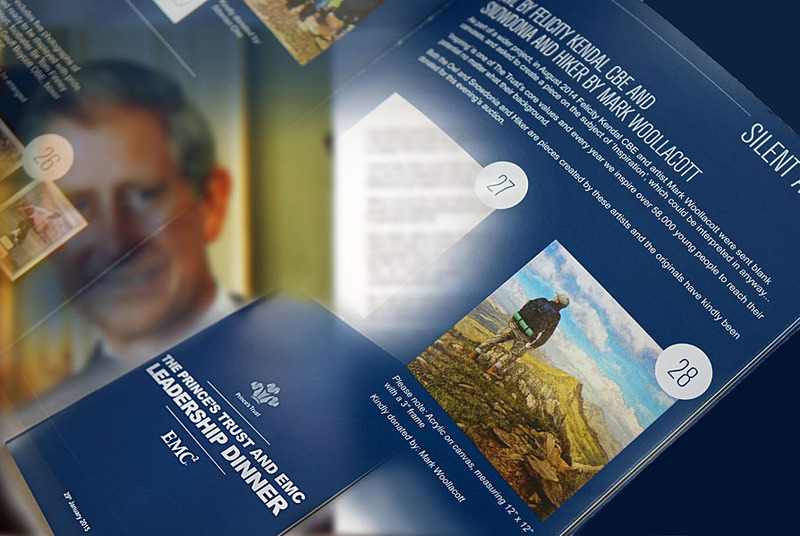 It was varnished on Monday 15th September 2014 and then mailed to The Prince's Trust, London, on 19th September. 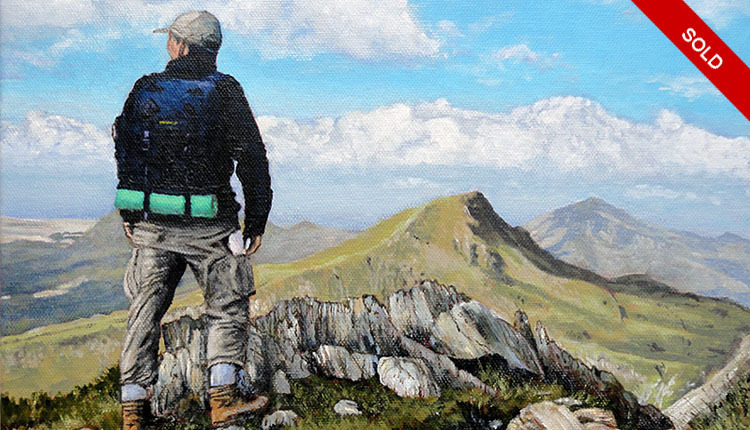 This landscape painting is based on a photograph of myself on a brief trip to Snowdonia, during June, 2014. I took this photo on Saturday 21st June, close to the southern side of Snowdon where the Watkin Path gradually ascends toward Snowdon's lofty summit. The view of the surrounding mountains was amazing and inspiring and weather conditions were perfect for walking. Mountains have long been associated as places where people have been inspired. The mountain and its path can be interpreted as a metaphor: the path representing the journey of one's life, a personal journey undertaken (something that changes a person inwardly, for the better); the realization of a personal goal, the right path that needs to be climbed, step by step, overcoming challenges along the way in order to achieve a sense of personal fulfillment and accomplishment; to elevate oneself to another level in order to transform one's life.